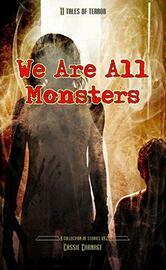 WE ARE ALL MONSTERS by Cassie Carnage brings you 10 Tales of Terror about vengeful ghosts (some friendly, some not), evil witches, horrifying tentacled gods that SHOULD NOT BE, necromancers, a plucky team of monster hunters in a losing war against the Vampire Kingdom, utter insanity driving a young man over the edge, murderous demons that return to finish off a grieving widow, vicious were-Sasquatches, and two teenage boys discovering that some urban legends are far too real (and deadly). Cassie Carnage gives us an unflinching glimpse at the atrocities that people commit in the face of terrible tragedies. With unpredictable twists that you’ll never see coming, these horror stories are refreshing, and sometimes touching, tales that deal with the horrors of everyday life, and the fantastic. They have a touch of magical realism that weaves powerful tension-filled stories full of terror, heartache, and loss. At the core of horror, there exists the dichotomy of fear and hope, and every single story in WE ARE ALL MONSTERS covers this theme. This horror story collection contains violence, gore, supernatural elements, vile demons, bloodthirsty vampires, and people driven mad by grief and despair. There’s a story in here for everyone. Fan Favorites include; HER ROTTEN EMBRACE, THE DYING LIGHT, and BLACK HEARTS AND BLOODIED LIPS.